On December 9, IBM announced an updated PureSystems Pattern for IBM Connections 5.0 as well as a brand new pattern for IBM Connections Content Manager 5.0. Both patterns have been built to reduce the installation and configuration time down to a couple of hours by deploying a pre-configured system into a PureSystems environment. IBM PureSystems combine the flexibility of a general purpose system, the elasticity of cloud and the simplicity of an appliance. 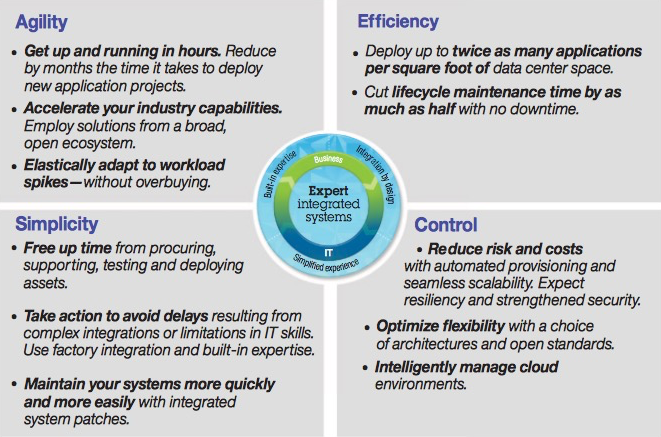 Learn more about IBM PureSystems here. Both patterns are based on the latest versions of IBM Connections and IBM Connections Content Manager and while the IBM Connections Content Manager Pattern is a brand new offering, IBM Connections 5 Pattern is a replacement for the previous IBM Connections Hypervisor Edition 4.0. Customers with entitlement to the Hypervisor pattern will be entitled to an upgrade to the new IBM Connections Pattern 5.0. For more information on IBM Connections, IBM Connections Content Manager and the new patterns click here. Here's one way to start the week on a high note. Over the weekend, we enabled the latest features for our Q3 (or fall release) of IBM Connections Social Cloud, which, as you can tell off the bat, features a new name and tons of goodies. Mitch and Chris had already shared the news about the new name, which we made public back in January of this year at IBM Connect 2014. You may have already seen the blog from last week from Rebecca Buisan which previewed some of the things that we turned on this past weekend. Let me take the opportunity to go into a bit more detail. How's that for a release ? But wait...! There's more! Developers.. we haven't forgotten about you!! 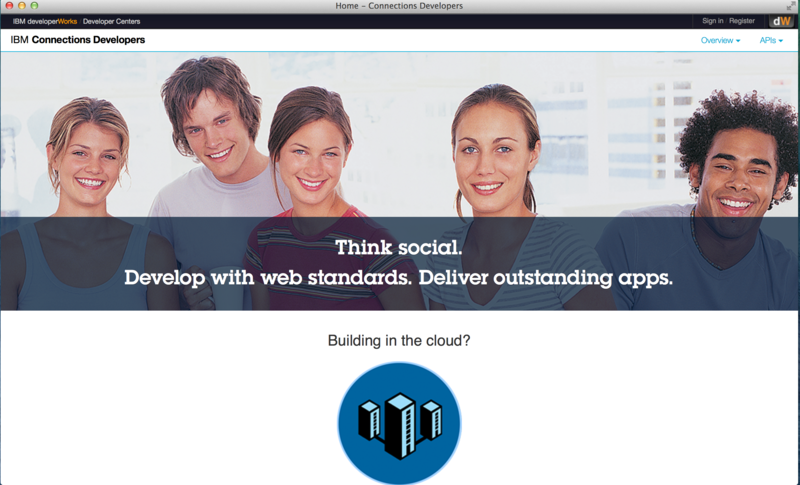 We are launching a new site just for you over at http://developer.ibm.com/social (screenshot above) very soon. We are going to be doing some continuous updates to this page so expect to see more changes soon. Additionally, we've created a schedule to continuously share content with you via the team blog. This will get you more content from more people and gives a hand to the super awesome Niklas Heidloff. If you haven't subscribed to that one, do it now. Want to get your hands on all of this? Start a trial today over at http://ibmcloud.com/social . I'm on my way to San Francisco, but I couldn't wait to share some fantastic news. For some time now there have been some hints of new things coming to Lynda. As you may have seen from teases in the past few weeks, today I'm happy to share that there's a new course available: Up and Running with IBM Connections by Bruce Elgort. Bruce and I collaborated on this, well, he actually did all the work, I just gave him a server to record on. For those of you who haven't heard about Lynda.com, they are an online learning company that helps anyone learn business, software, technology and creative skills to achieve personal and professional goals. Through individual, corporate, academic and government subscriptions, members have access to the lynda.com video library of engaging, top-quality courses taught by recognized industry experts. Not yet a Lynda.com subscriber? Try it out free for seven days. To see the course description, outline and get a quick intro (and a few free sections), click here. As you may know, we are now releasing new updates to the desktop plug-ins on a monthly basis. This month's release brings some cool new features to those of you working with Microsoft Office Desktop apps (even if you use the desktop apps with Office 365). For some time now, we've had integration into Microsoft Office (Word, PowerPoint, Excel, and Outlook) via the ribbon. Today, we've added new functionality to the ribbon. To download the latest plug-in you can get it from Apps - Downloads on your cloud deployment, or from our app catalog here. Put it in the books! For the 6th year in a row, Gartner has placed IBM Connections as a Leader in their recently released 2014 Magic Quadrant for Social Software in the Workplace. This year, I had the opportunity to engage in the entire process from beginning to end. The whole process started back in May of this year. There's a lot of things that happen during the evaluation process such as coordinating customer references, filling out feature surveys, showing the solution and more. So where do we go from here? We have a release coming to the cloud in several days which I'll share more details on soon. 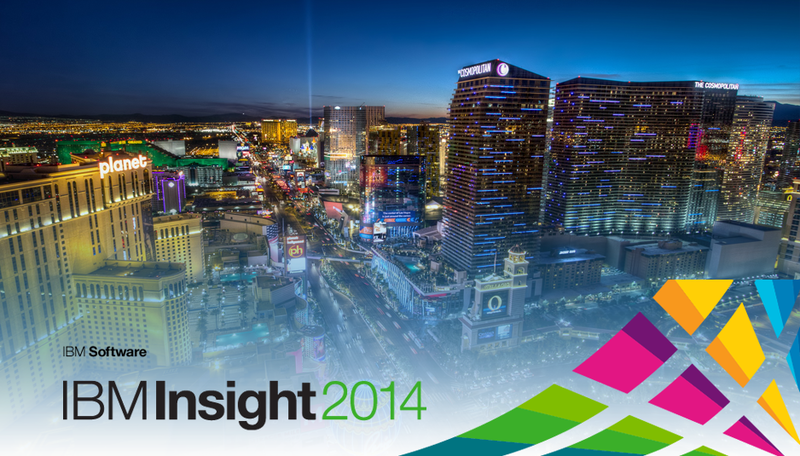 And don't forget to submit your abstract for IBM ConnectED on January 2015. To download the report, you can access it from Gartner's page here. To get the full benefit of social business, you must inject it into your key business processes for stronger customer engagement and workforce collaboration. But many enterprises are afraid to fully embrace social business, with 30 percent of them citing security concerns and perceived risk as major adoption barriers, according to IBM's 2014 Business Tech Trends report. But these fearful enterprises need to realize the true nature of social business. At its core, social business is a grassroots movement. Your customers have already embraced social. They’re online, on multiple channels, multiple platforms, talking about your business and reviewing your products and solutions. In other words, there’s no such thing as ‘opting out’ of social business. In fact, the real risks of security and brand perception are increased when you don’t engage in social business. If you're struggling to integrate social into the core of your business internally and externally, IBM can help. For example, IBM Connections can help you reorganize, restructure and transform your enterprise into an effective social business with social guidelines and policies set into place to optimize both customer engagement and your internal workforce communication. When social business is done right, the possibilities are endless. In fact, Pacesetters engaging in social business have reported an 87 percent stronger competitive advantage in their respective markets. To read the full IBM 2014 Business Tech Trends report, click here. To watch the webcast replay of the Business Tech Trends announcement, click here. After you’ve read the report, join us for a Bluemix app JAM! Simply download the report's data in an IBM Bluemix app and start discovering new insights! Share with us and IBM will highlight our favorites! Today, IBM was among the vendors that were cited as a Leader in Ovum's Decision Matrix: Selecting an Enterprise File Sync and Share Product, 2014-2015. This report was based on IBM Connections, both the cloud and on-premises version. W00t ! 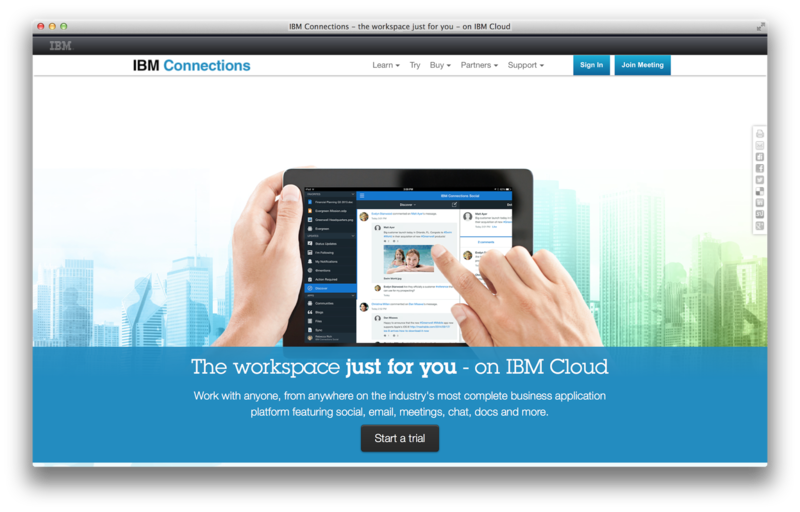 IBM Connections is IBM's premier cloud-based online collaboration platform (or enterprise social network). For some time now, I worked with my peers on this report showing Ovum the capabilities that we have today. Needless to say, I'm extremely excited that Ovum considers IBM Connections a leader in their Enterprise File Sync and Share Decision Matrix report! The report takes into consideration 241 data points around the end-use functionality of the 19 vendors evaluated and the "enterprise-fit" of the 19 vendors across 194 data points (yes, that's over 400 data points total!!). More and more companies are looking at leveraging cloud-based collaboration solutions. For example, aatranslations chose the IBM Connections platform on the cloud to better collaborate with its global employees. Congrats to the entire team who worked on this. To purchase the Ovum report now go here. 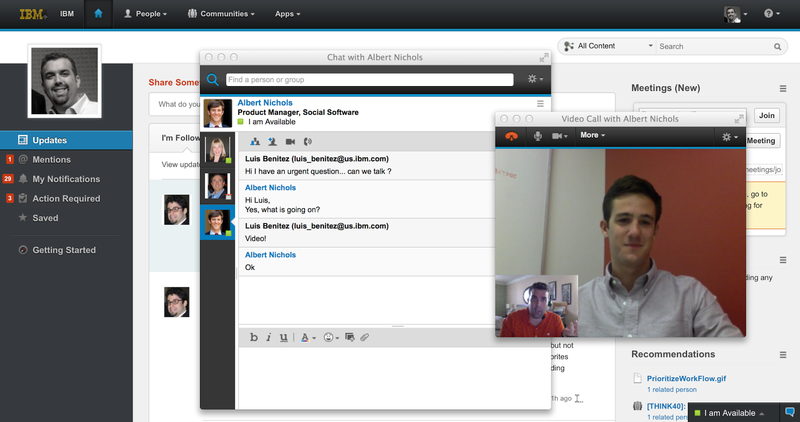 Today, when you log in to IBM Connections in the cloud you should notice a nice little surprise: you can now engage with your peers via audio and/or video chat. While you've always been able to instant message with your colleagues within IBM Connections, sometimes typing is just not fast enough. And with communication being roughly 70% non-verbal, video becomes an excellent capability to get business done... NOW! Now, you can go from a post in IBM Connection and escalate to a voice call or a video call at no extra cost. This is now available to Connections customers in the cloud. Plans start at $6/user/month so if you haven't started using this platform, you can start today with a 60-day free trial. Of course, I had to test this out to check out how it looks. So reached out to Albert, and got him over video in just 2 seconds! But wait... there's another surprise! Up until now you've been able to share files through Chat from your computer. 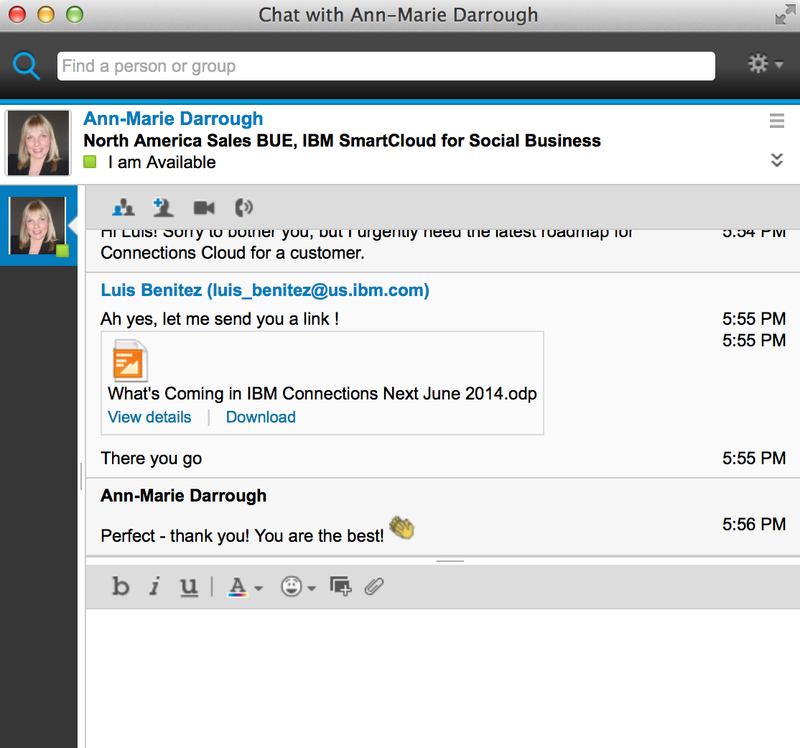 Now you can now share files with a chat partner from your IBM Connections Files. Let's say that you get a question from the field asking for the latest roadmap for your product (you know this happens a lot right?). Now I can take a file from Connections, and when I do this, the recipient automatically gets reader access to the file! Magic! Enjoy your new capabilities ! Last week I told you about the amazing results that Pacesetters are seeing from deploying social business solutions, according to IBM's 2014 Business Tech Trends report. This week I'm going to tell you what your enterprise can do to catch up in social based on those Pacesetters’ key practices. The Business Tech Trends report found that Pacesetters are using analytics as their fuel and integration as their breakaway move. So, what does this mean for social? Some of this might sound obvious to you, but the study found that Pacesetters are seven times more likely to use social business on the cloud and six times more likely to use social media analytics and mobile analytics than other enterprises! There is still a huge gap between the Pacesetters and everyone else. When it comes to social business, it's time to integrate and analyze. Read the 2014 Business Tech Trendsm report and then start analyzing it on IBM Bluemix at our Bluemix app JAM! Remember, share your insights and IBM will highlight our favorites! IBM's Center for Applied Insights has just released their 2014 Business Tech Trends report, which surveyed over 1,400 decision makers across 15 industries around the world to find out how businesses are deploying key technologies. The study found that social business is now being deployed by 70 percent of enterprises! That is more than double the number of enterprises (34 percent) that were deploying social business solutions in 2012. Pacesetters are achieving improved customer experience through social at six times the rate of other enterprises. Additionally, 72 percent of Pacesetters are seeing enhanced communication and collaboration across the organization and ecosystem through their social initiatives, which is also six times more than other enterprises! Furthermore, Pacesetters report that they are expanding into new markets and segments at three times the rate of other enterprises. It's clearer now than ever that having a social business strategy is imperative. But with 70 percent of enterprises deploying social, how do you get results like the Pacesetters? Stay tuned – I'm working on a post now that will tell you how! If you missed the webcast in which Sandy Carter, General Manager of Ecosystem Development, IBM, made the exciting Business Tech Trends announcement, not to fear you can re-watch it here! Last week, I ran into this video posted by Continental AG, a company of 170,000 people, which talks about their business networking event for their 450 social business ambassadors. Continental spoke at IBM Connect 2014 about their usage of IBM Connections. Continental brought the participants from 37 different countries to Hamburg Germany to start the conversation around how to improve the culture of communication and how to give employees a helping hand. To do this, Continental chose an open space, which they say it's similar to social media, where it's a big, empty and fluid environment. The goal was to spend 2 days and officially become GUIDEs. Individual interviews mention how the goal is to break the barriers between countries to become agile, interact better with others by knowing them better, and getting things done faster and more efficiently. For them, it was critical to exemplify their culture and core values like trust, freedom, solidarity and a winning mentality. I really like this approach and reminds me of what IBM did initially with our Blue IQ Ambassadors, though I was extremely impressed with Continental's approach to bring all these people together in a room to together learn and launch their social business platform. I typically get questions about how collaboration platforms compare, especially in a post-PC, mobile first era. The term was made popular by Steve Jobs in 2007 (though first coined at MIT), and 3 months ago Microsoft CEO said the company had entered the post-PC era. So mobile.. a critical capability. Can't be without it. It's essential. 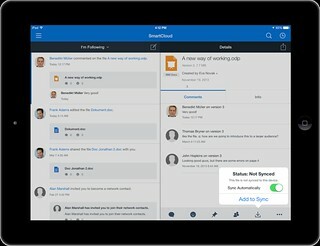 So here we are in 2014 -- a post-PC / Mobile First era, so let's take a look at comparing the mobile collaboration capabilities provided by IBM, with their market leading enterprise social collaboration platform called Connections, and Microsoft with a confusing story around SharePoint/Office 365/Yammer. To that end, I wanted to share a video that one of my colleagues, Reynout van Adrichem Boogaert, put together. It's a bit long because it does an amazing job at taking an in-depth look at collaborating while on the go -- a must for today's workforce. Of course, we can always look at app store ratings (Yammer has 3/5 stars in the app store, while the IBM Connections mobile app has 4.5/5 stars) which gives one angle, but let's get the full story. The video starts with a description of what the Yammer app can do and can't do. Now, what if you are in a situation where your company has made a decision to use some Microsoft technology? Well, another one of my colleagues has you covered. Omar Davison recently shared this video (you may have seen Suzanne Livingston's post last week) which tells the story of how you can use IBM Connections to enhance your Microsoft SharePoint and Microsoft Office tools. Ready to get started? Don't wait, start a free trial now (no credit card required)! By now, I'm sure that you are aware of TemboSocial. They have been adding value to IBM Connections, the market leading enterprise social collaboration platform, and it's some great work and I've talked about them in the past. The first add-on they created was a bit over 2 years ago when they first introduced The Hive for IBM Connections, a social recognition module. Last year, they further integrated with the IBM Connections platform by taking advantage of new integration points and extending our native mobile app in iOS and Android. 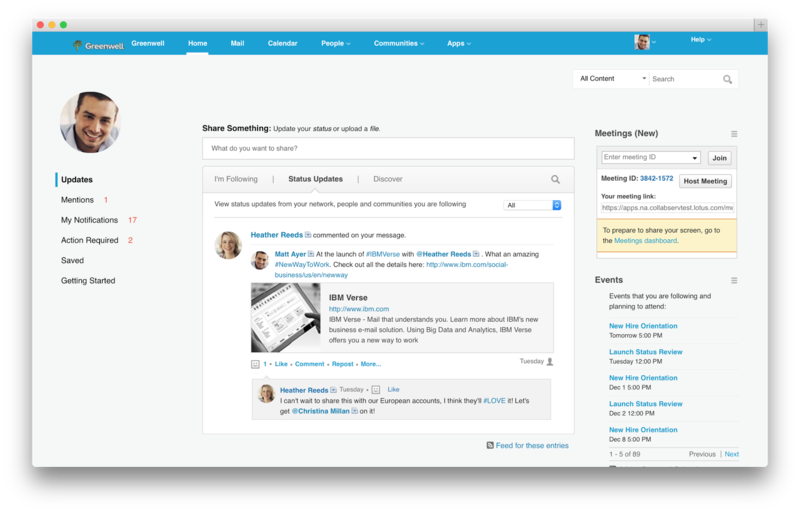 Now, TemboSocial has introduced TemboSocial Ideas for IBM Connections. This new add-on plugs directly into a team site within IBM Connections and takes ideation to the next level. With this add-on, you can crowdsource and gather ideas, surface the best ideas and comments, and the experts and moderators can curate the best contributions and provide updates on the idea (e.g. "In Progress", "Under Review", "Closed", etc). Additionally, it includes detailed real-time reports to determine sentiment, where the best ideas are coming from (e.g. by geography, role, workgroup, etc) and you can filter by time to measure the impact of your campaigns and see the results of your promotions. Update 2:30pm ET: Tembosocial Ideas is front and center at the customer IBM Webinar "Innovation Starts with Social: How IBM Connections Social Software can Transform your Organization - Tuesday August 26th"
"Join ICS NA Executive Sales Leader Laura Wolf and Tembosocial president and founder Steven Green on Tuesday August 26th. It's the "Aha" moment for LOB how to best get value from, Social (on-prem or cloud), how existing Social organizations can make Social more strategic, and where first time Social organizations can effectively start. " For more info, check out TemboSocial Ideas for IBM Connections. By now you are probably aware that the IBM Connections 5.0 Reviewer's Guide is available as shared by one of my teammates in the product management team, Albert Nichols. For a while now, I've been wondering how we can make this more widely available and perhaps add even more value to this great asset. Earlier in the year (if I remember correctly), I had heard that Apple had made iBooks Author a free app and decided to take that for a spin and see what I could do with it. And given the recent announcement of the Apple and IBM partnership, I figured why not! To my surprise, it was very simple to take the work that Albert (and the rest of the PM team had done) and import it into iBooks Author and add some dynamic elements to it. As you may know, the Reviewer's Guide covers a lot of the functionality within IBM Connections, as well as our different integration points into ECM, Notes, Microsoft Outlook, SharePoint, mobile, etc. Therefore, I thought that a good way to make the guide more dynamic would be to incorporate all the various demos directly into the book. My experience with iBooks Author was pretty positive. It only took a few minutes to convert the Reviewer's Guide into iBook format. Then, it took me about 5-6 hours to reorganize the content into iBook chapters, add the demos and interactive screenshots, and publish it to the iTunes store. During the publishing process, I even discovered that iTunes Producer already integrates with Aspera, an IBM company for super fast file transfer. Therefore, you now have a super easy way to get the Reviewer's Guide, access it offline, and even share with your peers. Go ahead and download the IBM Connections 5.0 Reviewer's Guide from the iBook Store and let me know what you think. I'm curious to know if this is valuable and if you would like to see more of these in the future. PS. There's 1 page that didn't come out correctly, but I'll let you find it. 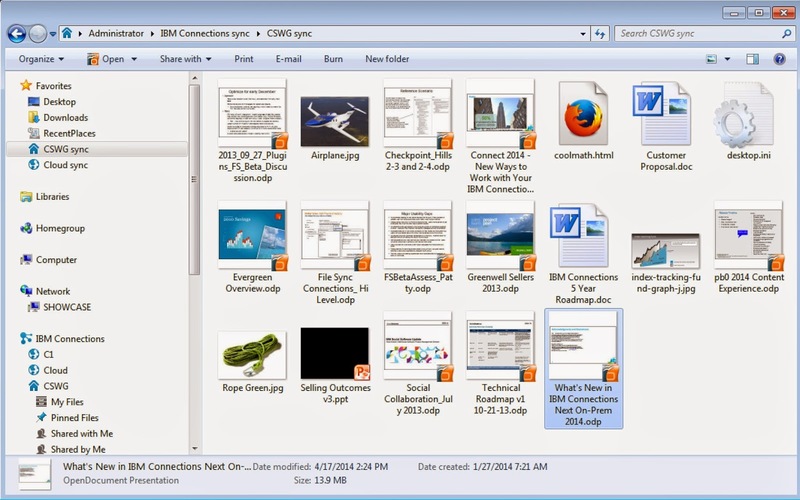 The new IBM Connections Desktop plug-ins for Microsoft Windows have just been released to our app catalog. There's a couple of things that I would like to call out here. First, IBM Connections 5.0 will be available for download next week. This is the first time that we have released the desktop plugins before the actual new server code is available. 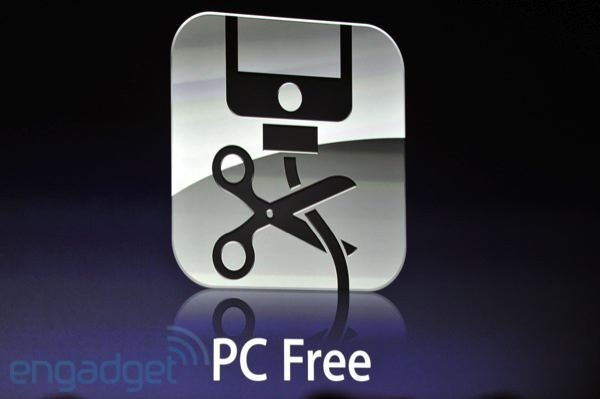 This is because the new desktop plugin also adds new features even if you are not using 5.0. Second, this is yet another simultaneous release for cloud and on-prem. Cloud customers can download the update directly from the "Apps - Downloads" page within Connections. Third, as I mentioned earlier in the week, this is the plug-in that adds File Sync capabilities for those that are using IBM Connections 5.0 or later. Fourth, this release also adds access libraries from IBM Connections Content Manager. Of course, this was already possible before but required installing a separate plugin. In this release, you now install only one plugin simplifying the deployment and adoption process. Lastly, but not least, this release also adds the ability to browse and access community folders. So go get it and download today! 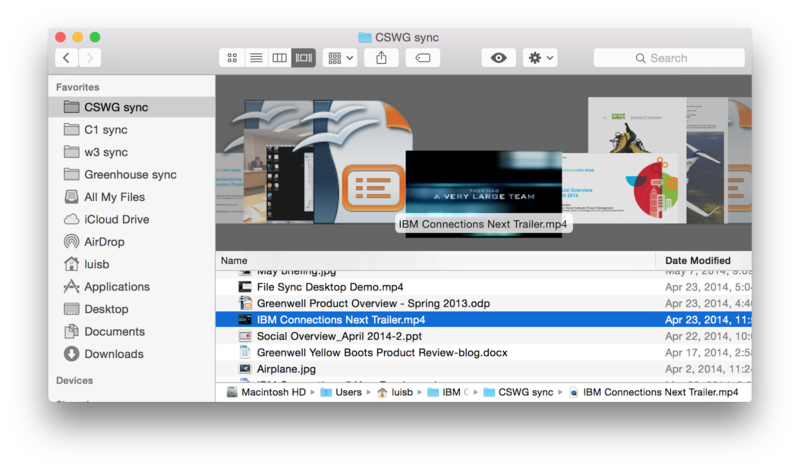 Now that we have officially announced IBM Connections 5.0 I wanted to take some time and talk about one of the top new features in this release: enterprise file sync and share. 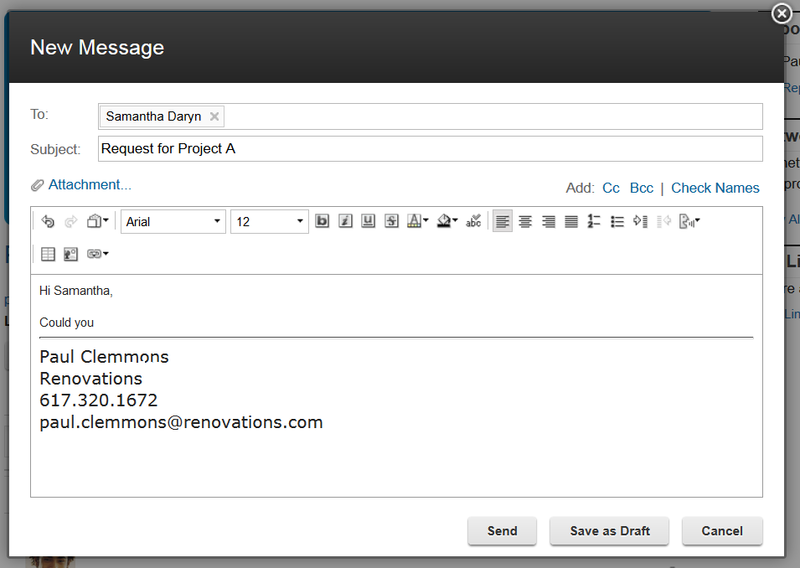 Also, if you haven't seen it yet, check out Suzanne Livingston's blog from yesterday where she talks about the new external collaboration features of IBM Connections 5.0. This is a capability that we've had available in our cloud for a while and now we are making it available to our on-prem customers. IBM Connections has already been cited by Forrester as a Leader in their Enterprise File Sync and Share Wave and IDC has stated that when it comes to marketshare, IBM Connections leads the way. So back to File Sync. 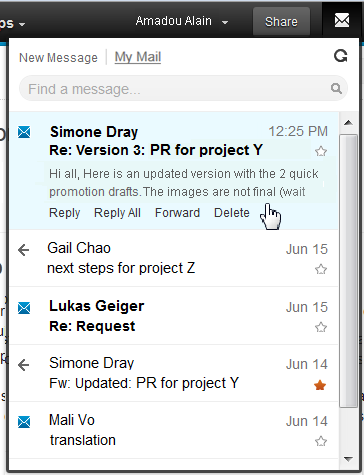 As you can see from the screenshot in the right, when you install the latest IBM Connections Desktop Plug-Ins (which will be available for download in a couple of days) a new Sync folder will be created under Favorites. 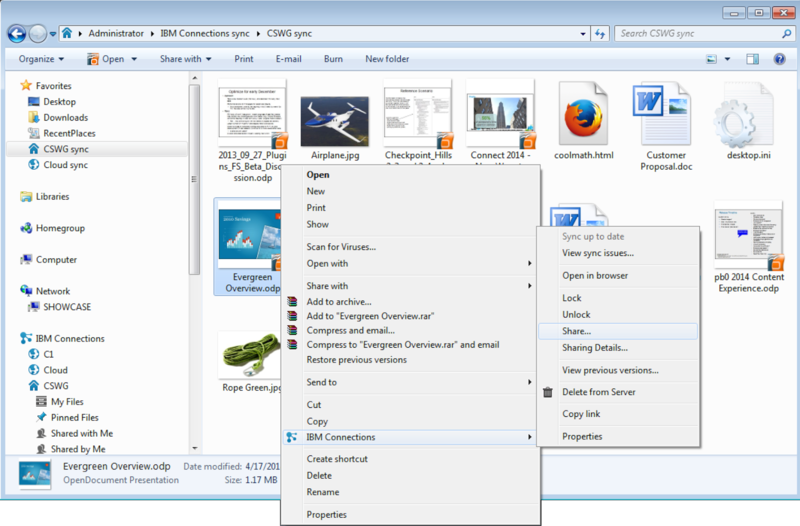 There you can save files directly to IBM Connections and use Connections as your personal backup drive where everything is sync'ed automatically (including of course edits that you make offline). Another added benefit and differentiator is that right from within your desktop you can right click on a file and act upon it. In other words, you can comment on it, tag it, like it, lock it (to prevent others from editing while you are offline) and even share it with other colleagues without ever having to open a browser. By default, all files are marked as private and only you have access to them. From there you can choose to share with individuals, groups, or communities. On the mobile side, you can use our native apps for Android and iOS and sync files to your favorite mobile device/tablet. On each device you can manually specify which files you want to have available there. For example, you may want some key presentations on your iPhone, while you have documents, spreadsheets and other assets available in your iPad. 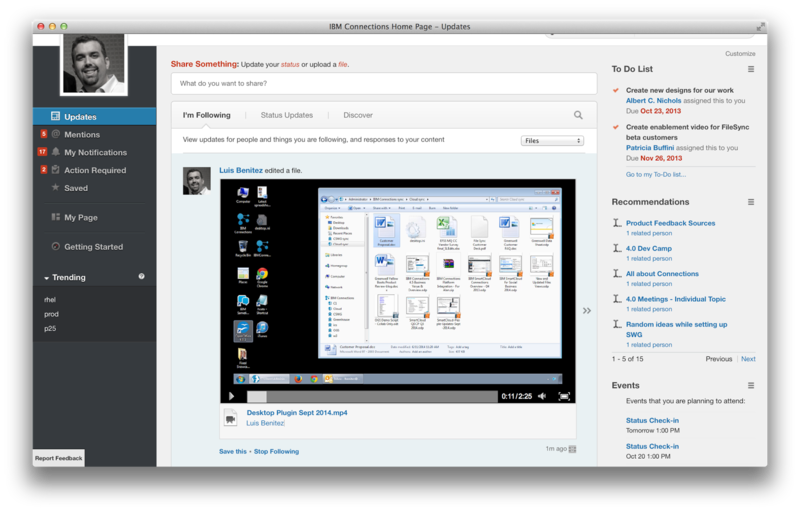 Here's a quick 5 minute demo that shows the enterprise file sharing and sync capabilities of IBM Connections 5.0. If you are an on-prem customer, get ready to download the code next week! Stay tuned for other new features in the coming days.